The Refugio San Eugenio is a place that has become home for youth on the outskirts of Buenos Aires. There is an Internet radio program, many snacks, scout groups and many teens come there to “heal their body and soul from the scourge of addictions”. There are also various sports, recreational, social and missionary activities. Serving at the Refugio are two Oblates, Frs. Sergio MENEGONI and Antonio MARIANGELI. 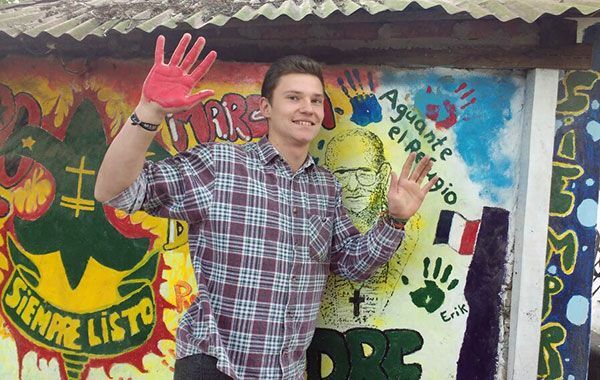 Here is the testimony of a young German who has spent some months in the Refuge as a volunteer. I am Friedrich Hartmann, from Germany and 19 years old. Last year I finished high school and thought a lot about what I was going to do this year. I thought about volunteering in a Christian community, in a social project outside Europe. I met the Divine Word missionaries who send young people out precisely to live such an experience. That’s how I got to the Refugio. Here I share community life; this means cooking, praying, working, giving talks and much more. A little tired but very happy with the afternoon sports activities, I go to the small chapel and get the keyboard ready. Together with the guitar, we start to play and sing songs of praise to the Lord. Slowly this house of God is filled with young people who come in dancing to the rhythm of the music. Each one already knows the melodies and dance steps by heart. It creates a climate of great joy and excitement. When we finish, the preacher steps before the congregation. They all raise their hands and ask the Holy Spirit to move within him, so that he can speak, filled with the experience of life. At that moment, even the noisiest go silent, closing their eyes and entering this extraordinary atmosphere. “Why do we believe and trust in the Lord?” The preacher begins to speak. “Because he let his Son die, out of his infinite love,” says one. Another adds, “To strengthen me in the challenges of life.” Each of the kids can now respond in turn. Suddenly one of the older kids raises his voice: “Because he changed my life,” he sings out as genuinely and clearly as I have ever heard. This thought touches me deeply and shows me one more face of the merciful God. While the speaker eloquently explains a text of the Bible, I get somewhat lost in my own thoughts, for this last testimony does not want to get out of my head and I begin to reflect on it a bit. And now something about the situation in the south of La Matanza. This area is part of the outskirts of Greater Buenos Aires, which has 13 million inhabitants. The Metropolis of the Tango, the cultural and luxurious center of the city, Buenos Aires, seems quite far away, although it is only 30 kilometers to the north. Here there is another reality and another society, marked by violence, drugs and alcohol. Especially the children and the youth in this area carry the burden and the crosses of all those crimes. For them, there exists only that world. The lack of focus, the lack of love in their own families, the lack of human values forces them to take to the streets and makes them use drugs, makes them steal. This is the sad fate of many young people. In order to prevent this bad influence and give young people a future, this ministry of the Missionary Oblates of Mary Immaculate was founded more than 10 years ago. Therefore, the idea is to love the youth as they are, with all that they have. Together with all the staff of the Refuge, there is created a climate that is totally opposite to the situation on the street. One deals with the other by respecting him, listening, speaking nicely, playing together. More than anything, you treat the other as a friend or brother. In the afternoon, the young people come and I spend hours together with them. We play ball, volleyball, ping pong or we drink mate while chatting. At those times, I have to be on the watch too, because sometimes they play to hard and that can cause fights. We don’t want that at the Refugio, because here we are not in the street. It is difficult to create this atmosphere. But when we have succeeded at that, then we spend a very joyful afternoon, especially for the youth. Two days a week I offer my “Circus Workshop”. I bring out my devil sticks and a balancing tape called a “slackline”. The youth like that a lot. And it fills my heart, especially when I see the kids with a giant smile when they have done a trick with the devil sticks or taken some steps on the slackline. Now I’m going back to Germany and I’m a little sad. But I have so many beautiful memories of very nice people and a new language for my country.